QoL is a multidimensional concept that has been used in different fields of knowledge including sociology, occupational functioning, politics, marketing, climate, and health care.7 Menopause-related symptoms have a negative impact on the QoL of perimenopausal women.7 Budakoglu et al,8 showed that the QoL in postmenopausal women is worse than that of premenopausal women. QoL can be assessed using both general and specific tools employed for specific conditions. General tools have generally no questions for specific conditions and diseases. However, specific tools with the same statements include some certain questions for these. General instruments cannot be used to assess the QoL in diseases since clinical features are not equal. Therefore, specific tools are generally preferable for each condition assessed and menopause is no exception.9 However, both tool types are used for measuring QoL in the literature. In this systematic review study, we identified general and specific instruments for assessing QoL and determined the factors related to QoL in menopausal women. Using the major electronic databases, including PubMed and Scopus, we searched for articles with the following key words: “(questionnaire OR scale OR inventory) AND (quality of life) AND (menopause OR menopausal)”. Articles published up to November 2014 were included in the search. The reference lists and related scientific conference databases were searched for additional data, and the authors of the studies were contacted for any additional unpublished studies. Studies were included irrespective of age, race, country, and publication status. The studies retrieved were mainly cross-sectional papers written in English and assessed the QoL in a multi-dimensional manner using general or specific questionnaires. Two authors separately screened the title and abstract of the retrieved studies and then reviewed the full texts to extract the studies that met the inclusion criteria of this systematic review. The variables extracted included the first author’s name, year, country, study design, and study results. Disagreements were resolved by discussion between the two authors. 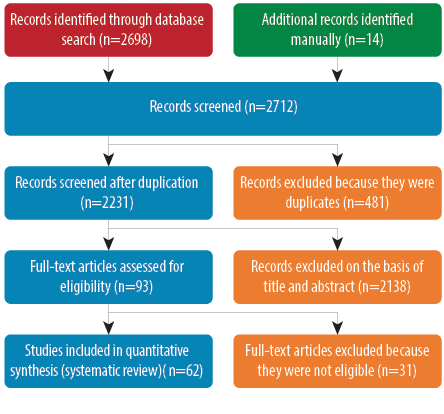 Figure 1: Flow diagram of the studies identified and excluded for use in systematic review process. We retrieved 2712 studies, including 2698 references through electronic databases and 14 references through checking references lists. A total of 481 studies were excluded because of duplication, and a further 2138 studies were excluded after screening the titles and abstracts, and 31 excluded after reviewing the full texts. In total, 62 studies were included [Figure 1]. To identify the tools used for measuring QoL, we used the Medical Outcomes Trust/Scientific Advisory Committee (SAC)10 criteria to carry out instrument assessment. The SAC defined eight key attributes of health status and QoL instruments including a) conceptual and measurement models, b) reliability, c) validity, d) responsiveness, e) interpretability, f) respondent and administrative burden, g) alternative forms, and h) cultural and language adaptation. In this study, we used the criteria for the conceptual and measurement models. The frequency of studies on the QoL in menopausal women from various countries was as follows: USA (n=9), Turkey (n=7), Iran (n=6), Spain (n=7), China (n=5), Taiwan (n=5), Colombia (n=4), India (n=4), and Poland (n=2). One study each was published in Greece, Tanzania, France, Canada, Australia, Japan, Poland, Brazil, Pakistan, Korea, Saudi Arabia, Chile, and Ecuador. In this review, eight specific and three general tools were included for assessment [Table 1]. Table 1: The general and specific instruments for assessing the quality of life in menopausal women. The Menopause Specific Quality of Life Questionnaire (MENQOL) is a validated questionnaire for the assessment of menopausal women’s symptoms and an effective instrument, although most researchers have recommended an investigation of the validity of this tool for use in different cultures and nations. A study by Nisar et al,11 showed that the scores of physical domain were significantly more in the postmenopausal group and menopause related symptoms had a negative impact on the QoL of postmenopausal women. In a study by Poomalar,7 menopause related symptoms had a negative impact on the QoL of perimenopausal and postmenopausal women and the scores of physical domain were significantly more in the late postmenopausal group. Abedzadeh et al,12 also used this tool and found that women who were employed, had a high educational level, a menopause duration of less than five years, and who had income and marriage satisfaction had a better QoL in the menopausal period. In another study by Norozi et al,13 in 2013, the QoL in postmenopausal women correlated with age, educational level, marital status, and employment status. The 36-item short-form (SF-36) was designed for use in clinical practice and research, health policy evaluation, and general population surveys. It was found that natural menopause is an independent predictor of a lower QoL in physical functioning.30 Budakoglu and colleagues8 showed that the QoL in postmenopausal women was worse than that of premenopausal women. They also showed that rural populations of women were in need of public health care in the postmenopausal period. In another study, Pan et al,44 reported an inverse association between weight gain and changes in physical health in the dimensions of physical functioning, physical role limitations, bodily pain, general health, and vitality. The World Health Organization Quality of Life (WHOQOL-BREF) instrument comprises 26 items, which measure the following broad domains: physical health, psychological health, social relationships, and environment. The WHOQOL-BREF is a shorter version of the original instrument and can be used for assessing the QoL in different cultures and populations using this instrument. Ozkan et al,31 showed that the QoL was significantly lower in women with vasomotor complaints. A high educational level correlated with an improvement in the QoL in menopausal women (years one to five) and women more than 10 years postmenopause had a better QoL. The Greene Climacteric Scale is a self-reported questionnaire that measures 21 physical and psychological symptoms associated with the menopausal transition.60 Giannouli et al,33 reported that the presence and identity of climacteric symptoms had a negative impact on QoL. The Utain Quality of Life Scale (UQOL) assesses how women perceive their life in each dimension independently of somatic or psychological complaints.61 In a study by Greenblum34 in 2013, menopausal symptoms commonly associated with the menopausal transition and early postmenopause negatively affected QoL. Giannouli and his collegues33 believed that a normal body mass index, married status, higher education, employment, good financial status, physical exercise, and a high calcium diet were associated with a better QoL. The Woman’s Health Questionnaire (WHQ) was developed to measure the perceptions of a range of physical and emotional symptoms in middle-aged women.62 Daley et al,36 believed that obese women had higher vasomotor and somatic symptom scores than women of normal weight during menopause. In a study by Ferrand,35 the level of national wealth, human development, cultural constraints, and social inequality were likely to explain how country and class affected QoL. Buendia Bermejo et al,47 showed that MENCAV is a valid and reliable questionnaire for assessing the QoL in menopausal women. The questionnaire includes 37 items and five dimensions. The 31-item Cervantes Scale is an advanced and validated tool. The scale’s short forms have 16 and 10 items. Llaneza and his colleagues49 showed that obesity did not affect the global health-related QoL. In their study, Monterrosa-Castro et al,52 showed that age, menopause status, body mass index, race, marital, and working status increased Menopause Rating Scale (MRS) scores. Table 2 shows the different factors related to the QoL in menopausal women in the literature. Table 2: Different factors related to the quality of life in menopausal women as given in the literature. This review study shows that both general and specific instruments were used for assessing the QoL in menopausal women with specific instrument such as SF-36 and MENQOL most frequently used. The application of specific tools has significantly increased since 1999. We found several specific tools were used for the assessment of QoL in menopausal women, but in some studies general tools were used. In a review study, Schneider et al,66 compared the sum-score of the SF-36 with the score of the somatic and psychological dimension of the MRS. They reported that the severity of menopausal symptoms were the best reflector of the profile of the QoL dimensions. In this review study, employment status and a high educational level in menopausal women were considered to be protective factors in improving QoL. The main predicting factors of QoL in menopausal women were found to be different in various populations because of differences in age, race, body mass index, duration of menopause, as well as social and occupational variables. Thus, identifying these related indicators can help to improve the QoL of these women through planning psychological consultations and practical interventions. This review study showed that some general and specific instruments such as SF-36 and MENQOL were the most frequently used tools for assessing QoL in menopausal women. Some studies used general tools for assessing the QoL in menopausal women and the specific tools used were diverse. The authors declared no conflict of interest. This article is part of a PhD thesis supported by Hamadan University of Medical Sciences. We would like to thank the University’s vice-chancellor of education and vice-chancellor of research and technology for their financial support to carry out the study. Izetbegovic S, Stojkanovic G, Ribic N, Mehmedbasic E. Features of postmenopausal uterine haemorrhage. Med Arch 2013 Dec;67(6):431-434. Farahmand M, Tehrani FR, Pourrajabi L, Najafi M, Azizi F. Factors associated with menopausal age in Iranian women: Tehran Lipid and Glucose Study. J Obstet Gynaecol Res 2013 Apr;39(4):836-841. Avraham Y, Nachum S. Management of Obesity in Menopause: Lifestyle Modification, Medication, Bariatric Surgery and Personalized Treatment. Current Topics in Menopause. Oak Park, Il, USA: Bentham Science; 2013:143-162. Deeks AA, McCabe MP. Well-being and menopause: an investigation of purpose in life, self-acceptance and social role in premenopausal, perimenopausal and postmenopausal women. Qual Life Res 2004 Mar;13(2):389-398. Nelson HD. Menopause. Lancet 2008 Mar;371(9614):760-770. Hilditch JR, Lewis J, Peter A, van Maris B, Ross A, Franssen E, et al. A menopause-specific quality of life questionnaire: development and psychometric properties. Maturitas 2008 Sep-Oct;61(1-2):107-121. Poomalar GK, Arounassalame B. The quality of life during and after menopause among rural women. J Clin Diagn Res 2013 Jan;7(1):135-139. Budakoğlu II, Ozcan C, Eroğlu D, Yanik F. Quality of life and postmenopausal symptoms among women in a rural district of the capital city of Turkey. Gynecol Endocrinol 2007 Jul;23(7):404-409. Blumel JE, Castelo-Branco C, Binfa L, Gramegna G, Tacla X, Aracena B, et al. Quality of life after the menopause: a population study. Maturitas 2000 Jan;34(1):17-23. Aaronson N, Alonso J, Burnam A, Lohr KN, Patrick DL, Perrin E, et al. Assessing health status and quality-of-life instruments: attributes and review criteria. Qual Life Res 2002 May;11(3):193-205. Nisar N, Sohoo NA. Frequency of menopausal symptoms and their impact on the quality of life of women: a hospital based survey. J Pak Med Assoc 2009 Nov;59(11):752-756. Abedzadeh Kalarhoudi M, Taebi M, Sadat Z, Saberi F. Assessment of quality of life in menopausal periods: a population study in kashan, iran. Iran Red Crescent Med J 2011 Nov;13(11):811-817. Norozi E, Mostafavi F, Hasanzadeh A, Moodi M, Sharifirad G. Factors affecting quality of life in postmenopausal women, Isfahan, 2011. J Educ Health Promot 2013;2:58. Williams RE, Levine KB, Kalilani L, Lewis J, Clark RV. Menopause-specific questionnaire assessment in US population-based study shows negative impact on health-related quality of life. Maturitas 2009 Feb;62(2):153-159. Som N, Ray S. Menopause-specific quality of life of urban women in West Bengal, India. Menopause Int 2012 Sep;18(3):99-105. Bal MD, Sahin NH. The effects of personality traits on quality of life. Menopause 2011 Dec;18(12):1309-1316. Nayak G, Kamath A, Kumar P, Rao A. A study of quality of life among perimenopausal women in selected coastal areas of Karnataka, India. J Midlife Health 2012 Jul;3(2):71-75. Bairy L, Adiga S, Bhat P, Bhat R. Prevalence of menopausal symptoms and quality of life after menopause in women from South India. Aust N Z J Obstet Gynaecol 2009 Feb;49(1):106-109. Fallahzadeh H. Quality of life after the menopause in Iran: a population study. Qual Life Res 2010 Aug;19(6):813-819. Chen Y, Lin SQ, Wei Y, Gao HL, Wang SH, Wu ZL. Impact of menopause on quality of life in community-based women in China. Menopause 2008 Jan-Feb;15(1):144-149. Chen Y, Lin SQ, Wei Y, Gao HL, Wu ZL. Menopause-specific quality of life satisfaction in community-dwelling menopausal women in China. Gynecol Endocrinol 2007 Mar;23(3):166-172. Caylan A, Aydemir I, Dagdeviren N, Akturk Z, Set T, Oztora S, et al. Evaluation of health related quality of life among perimenopausal Turkish women. Health Med 2011;5(4):741-752. Hilditch JR, Chen S, Norton PG, Lewis J. Experience of menopausal symptoms by Chinese and Canadian women. Climacteric 1999 Sep;2(3):164-173. Ghazanfarpour M, Abdolahian S, Zare M, Shahsavari S. Association between anthropometric indices and quality of life in menopausal women. Gynecol Endocrinol 2013 Oct;29(10):917-920. Limpaphayom KK, Darmasetiawan MS, Hussain RI, Burriss SW, Holinka CF, Ausmanas MK. Differential prevalence of quality-of-life categories (domains) in Asian women and changes after therapy with three doses of conjugated estrogens/medroxyprogesterone acetate: the Pan-Asia Menopause (PAM) study. Climacteric 2006 Jun;9(3):204-214. Van Dole KB, DeVellis RF, Brown RD, Funk ML, Gaynes BN, Williams RE. Evaluation of the Menopause-Specific Quality of Life Questionnaire: a factor-analytic approach. Menopause 2012 Feb;19(2):211-215. Timur S, Sahin NH. The prevalence of depression symptoms and influencing factors among perimenopausal and postmenopausal women. Menopause 2010 May-Jun;17(3):545-551. Yanikkerem E, Koltan SO, Tamay AG, Dikayak Ş. Relationship between women’s attitude towards menopause and quality of life. Climacteric 2012 Dec;15(6):552-562. Lima JE, Palacios S, Wender MC. Quality of life in menopausal women: a Brazilian Portuguese version of the Cervantes Scale. ScientificWorldJournal.2012 Mar;2012:620519. Żołnierczuk-Kieliszek D, Kulik TB, Jarosz MJ, Stefanowicz A, Pacian A, Pacian J, et al. Quality of life in peri- and post-menopausal Polish women living in Lublin Province–differences between urban and rural dwellers. Ann Agric Environ Med 2012 Mar;19(1):129-133. Ozkan S, Alataş ES, Zencir M. Women’s quality of life in the premenopausal and postmenopausal periods. Qual Life Res 2005 Oct;14(8):1795-1801. Chen PL, Chao HT, Chou KR, Huang HM, Cheng SY, Utian WH, et al. The Chinese Utian Quality of Life Scale for women around menopause: translation and psychometric testing. Menopause 2012 Apr;19(4):438-447. Giannouli P, Zervas I, Armeni E, Koundi K, Spyropoulou A, Alexandrou A, et al. Determinants of quality of life in Greek middle-age women: a population survey. Maturitas 2012 Feb;71(2):154-161. Greenblum CA, Rowe MA, Neff DF, Greenblum JS. Midlife women: symptoms associated with menopausal transition and early postmenopause and quality of life. Menopause 2013 Jan;20(1):22-27. Ferrand F, Hajri S, Benzineb S, Draoui DM, Hassoun D, Delanoë D, et al. Comparative study of the quality of life associated with menopause in Tunisia and France. Menopause 2013 Jun;20(6):609-622. Daley A, Macarthur C, Stokes-Lampard H, McManus R, Wilson S, Mutrie N. Exercise participation, body mass index, and health-related quality of life in women of menopausal age. Br J Gen Pract 2007 Feb;57(535):130-135. Shin H. Comparison of quality of life measures in Korean menopausal women. Res Nurs Health 2012 Aug;35(4):383-396. Hautamäki H, Haapalahti P, Savolainen-Peltonen H, Tuomikoski P, Ylikorkala O, Mikkola TS. Premenstrual symptoms in fertile age are associated with impaired quality of life, but not hot flashes, in recently postmenopausal women. Menopause 2014 Dec;21(12):1287-1291. Extremera N, Fernández-Berrocal P. Relation of perceived emotional intelligence and health-related quality of life of middle-aged women. Psychol Rep 2002 Aug;91(1):47-59. Avis NE, Ory M, Matthews KA, Schocken M, Bromberger J, Colvin A. Health-related quality of life in a multiethnic sample of middle-aged women: Study of Women’s Health Across the Nation (SWAN). Med Care 2003 Nov;41(11):1262-1276. Anderson DJ, Yoshizawa T. Cross-cultural comparisons of health-related quality of life in Australian and Japanese midlife women: the Australian and Japanese Midlife Women’s Health Study. Menopause 2007 Jul-Aug;14(4):697-707. Fuh JL, Wang SJ, Lee SJ, Lu SR, Juang KD. Quality of life and menopausal transition for middle-aged women on Kinmen island. Qual Life Res 2003 Feb;12(1):53-61. Chiu YW, Moore RW, Hsu CE, Huang CT, Liu HW, Chuang HY. Factors influencing women’s quality of life in the later half of life. Climacteric 2008 Jun;11(3):201-211. Pan A, Kawachi I, Luo N, Manson JE, Willett WC, Hu FB, et al. Changes in body weight and health-related quality of life: 2 cohorts of US women. Am J Epidemiol 2014 Aug;180(3):254-262. Laferrère B, Zhu S, Clarkson JR, Yoshioka MR, Krauskopf K, Thornton JC, et al. Race, menopause, health-related quality of life, and psychological well-being in obese women. Obes Res 2002 Dec;10(12):1270-1275. Shyu YK, Pan CH, Liu WM, Hsueh JY, Hsu CS, Tsai PS. Health-related quality of life and healthcare resource utilization in Taiwanese women with menopausal symptoms: a nation-wide survey. J Nurs Res 2012 Sep;20(3):208-218. Buendía Bermejo J, Valverde Martínez JA, Romero Saiz A, Ulla Díez SM, Cobo Rodrigo A, Martínez Vizcaíno V. Validation of a menopause quality of life scale: the MENCAV scale. Maturitas 2008 Jan;59(1):28-37. Calvo-Pérez A, Campillo-Artero C. Quality of life of menopausal women in the island of Majorca: a population based study. Gynecol Endocrinol 2013 Jun;29(6):556-558. Llaneza P, Iñarrea J, Gonzalez C, Alonso A, Arnott I, Ferrer-Barriendos J. Differences in health related quality of life in a sample of Spanish menopausal women with and without obesity. Maturitas 2007 Dec;58(4):387-394. Chedraui P, Pérez-López FR, Sánchez H, Sánchez P, Miranda O, Quispe P, et al. Application of the 10-item Cervantes Scale among mid-aged Ecuadorian women for the assessment of menopausal symptoms. Maturitas 2014 Sep;79(1):100-105. Coronado PJ, Borrego RS, Palacios S, Ruiz MA, Rejas J. Structural validity of a 16-item abridged version of the Cervantes Health-Related Quality of Life scale for menopause: the Cervantes Short-Form Scale. Menopause 2015 Mar;22(3):325-336. Monterrosa-Castro A, Romero-Pérez I, Marrugo-Flórez M, Fernández-Alonso AM, Chedraui P, Pérez-López FR. Quality of life in a large cohort of mid-aged Colombian women assessed using the Cervantes Scale. Menopause 2012 Aug;19(8):924-930. Javadivala Z, Kousha A, Allahverdipour H, Asghari Jafarabadi M, Tallebian H. Modeling the relationship between physical activity and quality of life in menopausal-aged women: A cross-sectional study. J Res Health Sci 2013;13(2):168-175. Chedraui P, Blümel JE, Baron G, Belzares E, Bencosme A, Calle A, et al. Impaired quality of life among middle aged women: a multicentre Latin American study. Maturitas 2008 Dec;61(4):323-329. Chou MF, Wun YT, Pang SM. Menopausal symptoms and the menopausal rating scale among midlife chinese women in Macau, China. Women Health 2014;54(2):115-126. Krajewska K, Krajewska-Kułak E, Heineman L, Adraniotis J, Chadzopulu A, Theodosopoyloy E, et al. Comparative analysis of quality of life women in menopause period in Poland, Greece and Belorussia using MRS Scale. Preliminary report. Adv Med Sci 2007;52(Suppl 1):140-143. Ornat L, Martínez-Dearth R, Muñoz A, Franco P, Alonso B, Tajada M, et al. Sexual function, satisfaction with life and menopausal symptoms in middle-aged women. Maturitas 2013 Jul;75(3):261-269. Alquaiz JM, Siddiqui AR, Tayel SA, Habib FA. Determinants of severity of menopausal symptoms among Saudi women in Riyadh city. Climacteric 2014 Feb;17(1):71-78. Ojeda E, Monterrosa A, Blümel JE, Escobar-López J, Chedraui P. Severe menopausal symptoms in mid-aged Latin American women can be related to their indigenous ethnic component. Climacteric 2011 Feb;14(1):157-163. Greene JG. Constructing a standard climacteric scale. Maturitas 2008 Sep-Oct;61(1-2):78-84. Utian WH. NIH and WHI: time for a mea culpa and steps beyond. Menopause 2007 Nov-Dec;14(6):1056-1059. Hunter MS. The Women’s Health Questionnaire (WHQ): frequently asked questions (FAQ). Health Qual Life Outcomes 2003;1(1):41. Jones GL, Sutton A. Quality of life in obese postmenopausal women. Menopause Int 2008 Mar;14(1):26-32. Monterrosa-Castro A, Carriazo-Julio SM, Ulloque-Caamaño L. Prevalence of insomnia and quality of life for post-menopausal women suffering hot flushes living in the Colombian Caribbean region. Rev Colomb Obstet Ginecol 2012;63(1):36-45. Chedraui P, San Miguel G, Avila C. Quality of life impairment during the female menopausal transition is related to personal and partner factors. Gynecol Endocrinol 2009 Feb;25(2):130-135. Schneider HP. The quality of life in the post-menopausal woman. Best practice & research. Clin Obstet Gynecol 2002 Jun;16(3):395-409.